Improve quality of life. Address regional inequalities. Build a sustainable city of the future. Those are the lofty goals established by the State and Ile-de-France – a region of 12 million inhabitants – with the ambitious Grand Paris development project. Modernizing the existing transportation network and constructing a new automatic metro – the Grand Paris Express, lie at the heart of this grand vision. Project work will take place not only in Paris but the outlying metropolitan areas as well, which includes the City of Versailles. A city of 90,000, many of Versailles’ citizens work in Paris. Tens of thousands of people daily board the train from one of five stations to commute to and from Paris. 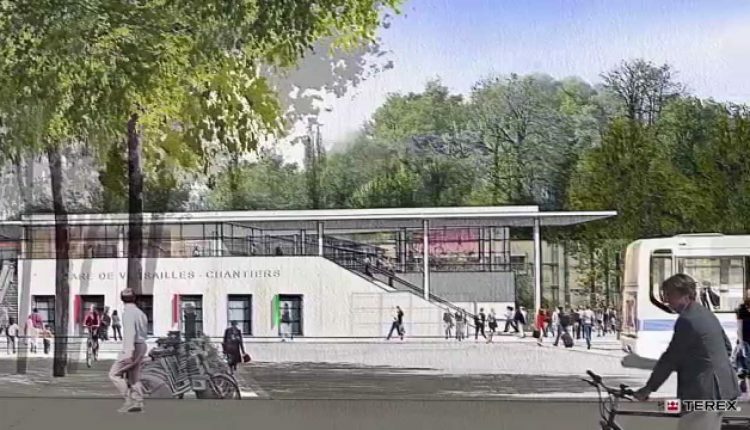 The Versailles Chantiers train station alone serves nearly 70,000 passengers each day. To accommodate the growing number of passengers using this critical train station hub, the National Society of French Railways (SNCF) – France’s national state-owned railway company –added a pedestrian bridge over the railroad tracks for easier access to the station from the parking lot as part of The Grand Paris program. Additionally, the clock was ticking for DUFOUR on this project. Installing the metal footbridge over the tracks meant that the Versailles train station had to be temporarily closed. “For one weekend, the station was completely closed and, during lifting operations, train traffic was also fully stopped from Paris to the south of France, which rarely occurs,” says Devianne. During that weekend, 350 buses had to be arranged to accommodate commuters typically riding the trains originating from the Versailles Chantiers station. In early February, DUFOUR’s crews loaded the Superlift 3800 crane components from a project site in Germany to make the approximately 400-km (250-mi) trip to the Versailles Chantiers station. Thirty-seven trucks were used to transport 275 tonnes (298 US t) of counterweight, 90 m (295 ft) of boom segments, the Superlift structure and carrier components. With the aid of a 250-tonne (300-US-t) capacity class Terex® AC 250 all terrain crane, six DUFOUR crew members, including two crane operators, began assembling the crane and Superlift structure once the components arrived at the train station. Terex Cranes’ Hemmert also aided with crane erection and, three short days later, the Superlift 3800 was ready to assist with bridge construction. The superlift tray and crawler carrier were loaded with 225 tonnes (250 US tons) and 50 tonnes (55 US t) of counterweight respectively to handle bridge segment weight when working at radii in excess of 70m (230 ft). To lift the metal structures in place, the Superlift 3800 crane required 90 m (295 ft) of main boom. Working in an extremely confined area, crews attached the first metal bridge segment weighing 80 tonnes (88 US t) to the crane’s cables. At a radius of 76m (249 ft), the Superlift 3800 crane hoisted the segment into place for installation. “Even at this extended radius, the Superlift 3800 crane offers a lift capacity of more than 85 tonnes (94 US t) in this configuration, which was more than sufficient for the pick,” mentions Hemmert. The Superlift 3800 crane then hoisted the heavier, 111-tonne (122-US-t) metal segment into position, working at a 51-m (167-ft) radius. “Some of our company leaders were on the jobsite during the lifts, and they were all impressed with the crane and how smooth and precise it lifted the two metal footbridge segments,” says Devianne. Within the short weekend timeframe allotted to DUFOUR for footbridge installation, crew members were able to complete both bridge picks, so the Versailles Chantiers train station could reopen on schedule. The station now is back to operating at normal capacity, and commuters have a safer and more direct route to get to the train station from the parking lot.